Salvatore is one of those loud, perpetually grinning, mischievous movie kids who are just crying out to be slapped. 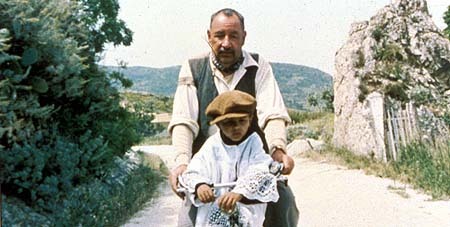 He lives in a dusty Italian village, the sort where women breastfeed in the cinema, all the men wear cloth caps and all the old women wear headshawls. The village folk like to engage in cute pranks such as dropping insects into a sleeping man’s open mouth. You know the kind of place—you’ve seen it in movies. In this village there is a cinema. The patrons sit on wooden chairs and greet each other loudly as they come in. The local priest—a typical movie caricature of Catholic priests, though at least an affecionate one—insists on all kissing scenes being cut from the movies shown in the Cinema Paradiso, much to the displeasure of the locals. Salvatore bothers the projectionist and cinema manager, Alfredo, to teach him the trade. 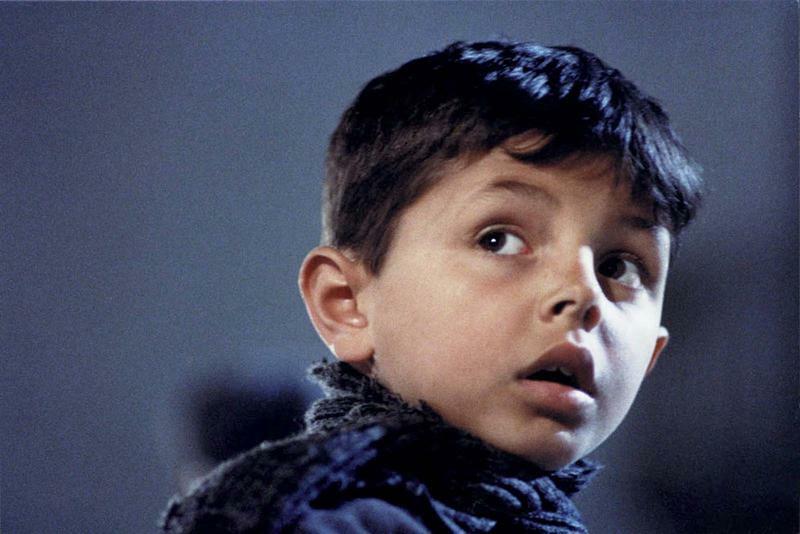 Reluctantly, he does, and when Alfredo is blinded by a cinema accident (in one the film’s best scenes) Salvatore takes over. We see him grow from an unbearably twee child to a simpering, mooning young man who takes a shine to a local girl and stands outside her window for weeks on end. Stalking was obviously not a big deal in the Italy of the fifties. OK, I’m being unduly sarcastic—this film is well aware of its own nostalgia and implausibility, and when it leaps forward to the middle–aged Salvatore—now a successful film director—we realise, from the sudden realism, that we’ve been seeing Salvatore’s childhood through his own rosy glasses. 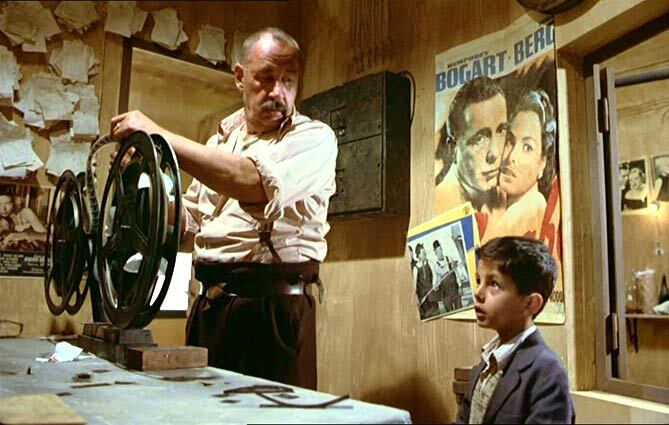 The lurch from sentimental memories to painful reality gives Cinema Paradiso an edge, one that saves it from picture-postcard triteness. Whether it’s enough to make it a classic, a status it seems to have won in many peoples’ minds, is more doubtful. 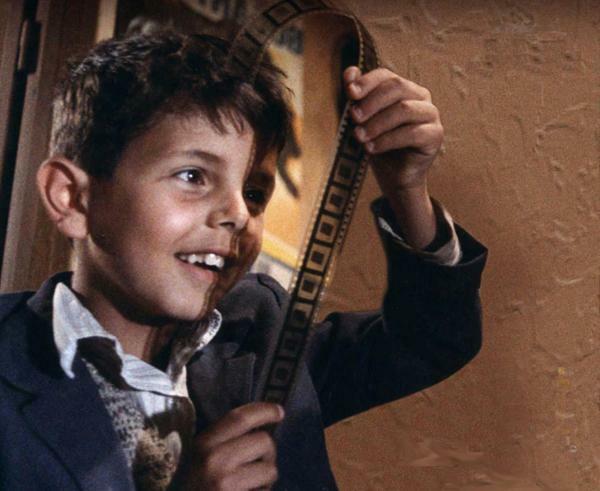 It’s notable that Cinema Paradiso didn’t do well in its original Italian run. This is the kind of film that benefits from subtitles; if it was a British or American film, English-speaking critics would probably have been much harsher on it. As an evocation of movie magic, I found it rather lacking. 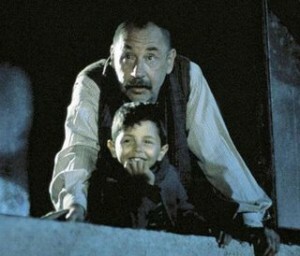 There isn’t really very much of the movies in Cinema Paradiso. Sure, Alfredo imparts Salvatore wisdom gleaned from John Wayne and Clark Gable, and we see the villagers rolling in the aisles at funny scenes, then weeping copiously at sad scenes. But somehow I get the impression they would have been just as happy playing bingo, or watching girls dancing the can-can. Salvatore waits outside a girl’s window for weeks on end (or remembers himself as having done so). But any romantic young man in any time might have done that, cinema or no cinema. “Life is not like the movies”, Alfredo tells Salvatore at one point. In truth, neither of them ever really seems in danger of believing that it is. This is a film about a village, not a film about a cinema. But it’s always a danger sign when a movie is legendary only for one moment—like the axe-through-the-door moment in The Shining. Cinema Paradiso is a cute film with a touch of class. It doesn’t capture the real magic of the movies, and I very much doubt anyone will be calling it a classic in twenty years time..